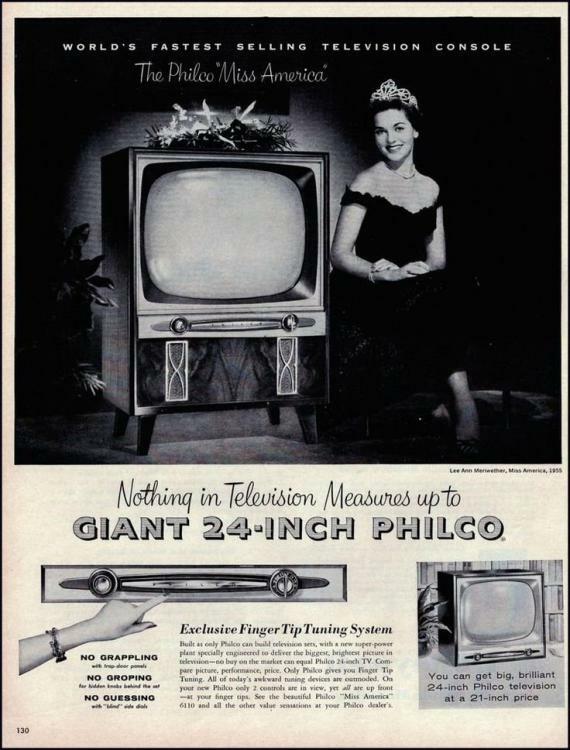 For those PTUers with an interest in old TV technologies. Some may not know, Alliance was a long time well-known maker of antenna rotators. 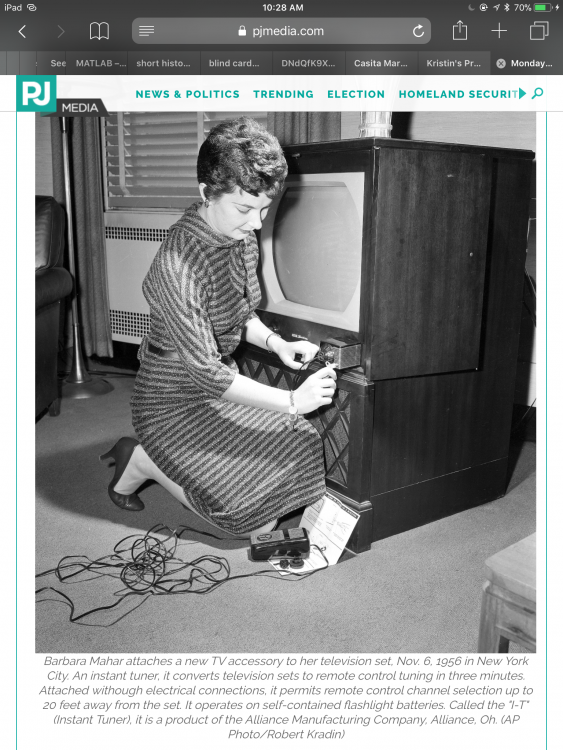 I believe the key she is turning operated a toggle bolt mechanism to clamp the unit to the face of the TV through the hole behind the original channel knob. I also think the box on the TV contained a DC motor and gears that had deliberate backlash (free play) so that the tuner's detent for each channel could operate without the exact rotation angle being forced by the motor. 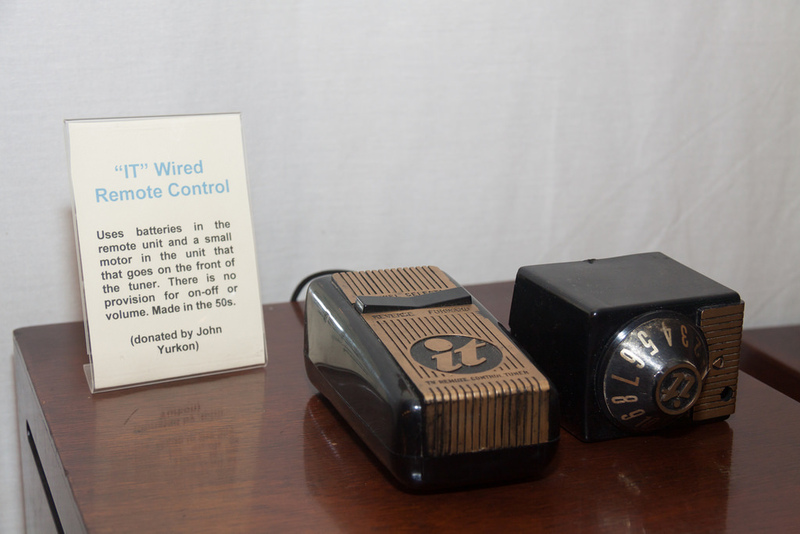 The remote box would contain the batteries and push-button switches for forward and reverse. It would be up to the user to hold down the button until the tuner went "clunk" into the next detent, and quickly release before the tuner was driven out of the detent. Operation with this device would be iffy for TV models that didn't have an individual preset fine tuning adjustment for each channel. Many households already had a mobile wireless remote in the form of a kid who would be told to get up and change the channel. All she needs next is one of the gadgets that promised to magnify your screen to become a big-screen set. 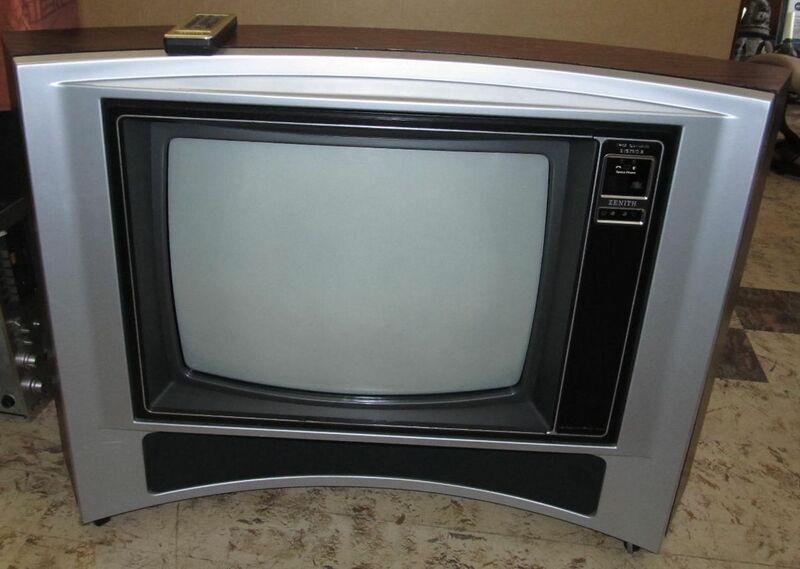 I see that the screen was round with the top and bottom masked off; could this have been an early color TV? You've got the shape right, but this one was black and white. By the way, the round tube black and white sets were already out of style in 1956. Maybe some of my fellow collectors can identify this model's year. My price was a bowl of popcorn. "1949 RCA Model No. 9-TC-272 B/W set with the 16AP4 CRT. Outstanding performer too, 4 or 5 IF stages, DC coupled video." Here's one of the remotes at the Early Television Museum, so I guess I did see one, but I didn't remember; and also a "color converter" plastic sheet. I wish I still had one of those heavy remote control devices that earned those contraptions the nickname "Clicker." I can still envision our Zenith Space Commander 600. Looks like cabinet had two doors that swung closed to hide unsightly screen. Mounting the motor box prevents that door from closing and leaves a tangled wire trailing to the remote. I’ll bet a lot of fuming wives folded their arms and glowered at that contraption as though it were a leg lamp. 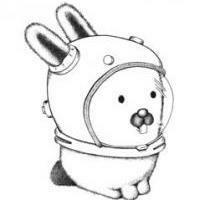 I can’t improve resolution to allow manual to be read. I knew that the first B/W TV screens were also round, but I thought they had died out by the mid-50's... We had a Dumont but the screen was already squared off. 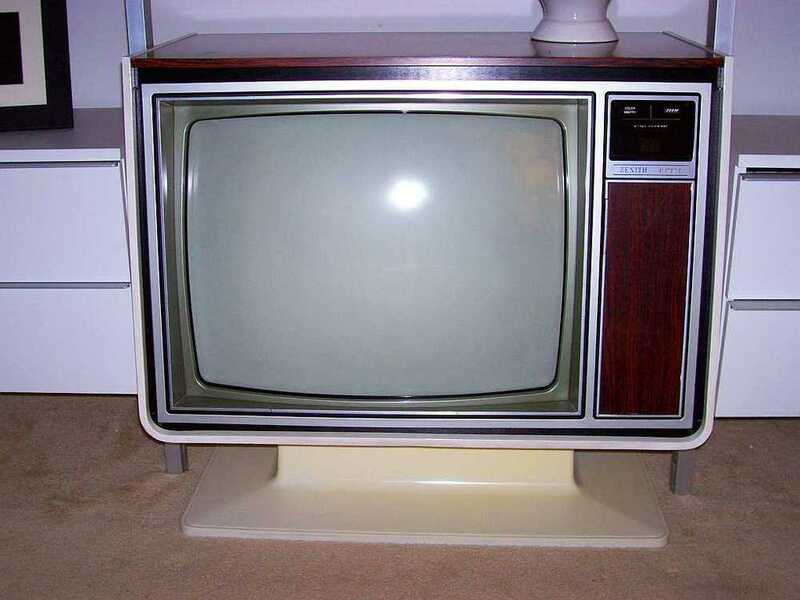 Now, I do remember those plastic sheets to turn B/W into COLORED TV! They must have studied P.T. Barnum 101 "There's a sucker born every minute". In that photo of the plastic sheet it says 'Color by Eastmon." "It's the Jamican branch of Kodak, mon!" The great-granddaddy of malicious internet sites. "...a 1951 9-T-77. The screen is 19" on the 9-T-77 and the 9TC272 did not have the doors depicted. The 9-T-77 did." Also worth noting: the cabinet door could no longer be closed after installing this device = zero WAF (Wife Acceptance Factor). Man's response- silently goes out to the garage to get a screwdriver to take off the cabinet doors. Doors just get in the way of watching the Yankees vs the Dodgers in the '56 World Series anyway. As Archie Bunker might have said "if the Good Lord had intended doors to be on da cabinet, he woulda put doors on the Ark before he gave it to Moses dere in da desert. See Moses needed to watch da tv in da Ark constantly to keep an eye on Pharoah sneekin' up on 'em from beyond. No doors. Pharoah drowns. Simple as dat." Another TV for Wayne . My wife inherited a Zenith Space Command TV from her great grandfather in 1986. I swear that thing weighed at least 200 pounds. We moved that damn thing from Michigan to two apartments in Florida, and back to Michigan. The 'clicker' was basically just tuning forks inside the handheld gadget. Pressing a button struck a tuning fork. Based on the sound the TV heard, it changed the volume, channel, or power. If you jingled your keys in front of it, it would change volume. Finally got rid of the TV, but I kept the remote! And I've heard about the color converters, but never saw one. Thanks for posting! You are probably thinking of the Zenith Avanti (pedestal cabinet) or maybe the curved console. Growing up near that town, there's nothing there! Looked up the company a little further, no wonder. 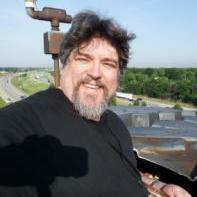 They became the Genie Garage Door opener company and moved to a nearby county. 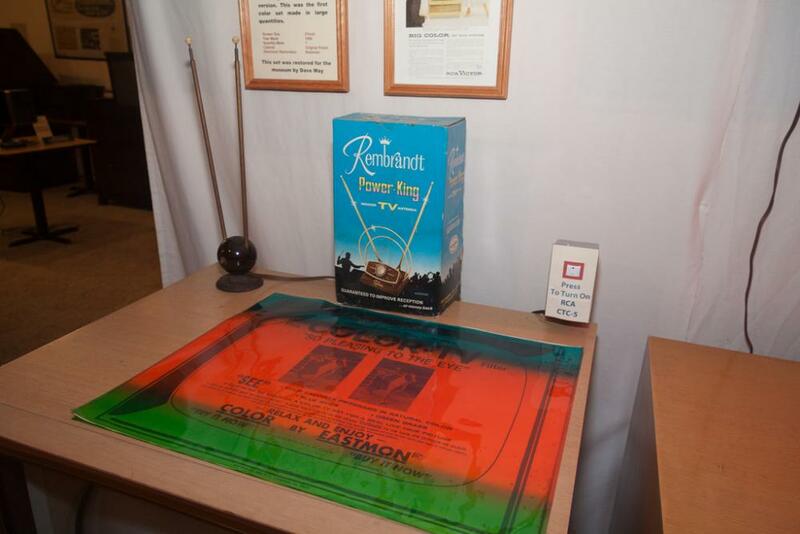 Where is the Early Television Museum located? My grandmother invited all of her family to her house to see her new "color" TV. It was one of the colored pieces of cellophane (pictured above) which attached to the front of the picture tube. For her soap operas and "The Andy Griffith Show" it worked pretty well. For close-ups the faces were reddish, the grass was green, and the sky was blue. We all left shaking out heads. The Early Television Museum is in Hilliard, Ohio, just west of Columbus. Thanks. From the looks of the website, it looks like it's worth the trip. Comments? Currently open to the public two days a week, so check with them before deciding to go. If you are interested in the technology, rather than programming history, this is the place for you. The amazing thing in that regard is how many sets have been restored to operation. The collection goes from the 1920s through the early 1950s, everything from mechanical TV with pictures the size and detail of a computer icon to the earliest color TVs. They have plans to expand at least up through the 1970s, as they are getting more and more school trips, and that is still ancient history to the kids, although not yet the hottest topic for collectors. Their annual convention, which includes an auction, swapmeet, and presentations on the technical side of TV history, (plus a luncheon and optional dinner) was just a week ago. Follow the convention links on their site to see photos of this year's and past conventions. This have definitely peaked my interest, as I am more interested in the technical side of things. I could spend a day just on the website. There was a broadcast station in Connecticut in the early 60's that carried only pay per view movies (they were scrambled), and I could never figure out how it worked. Maybe now I finally can.